Scraping the Sky is hand assembled and saddle stapled. It features a pale gray stock cover, sky blue end papers and eggshell faux parchment pages. 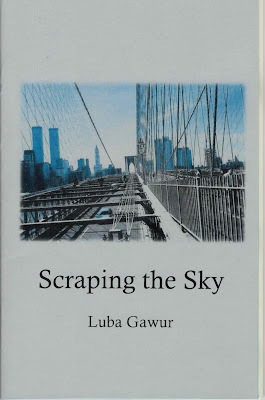 Cover photo by Luba Gawur. 8.5 x 5.5". Laser printed. ISBN: 978-1-940996-41-7. Limited 1st edition of 99 copies. 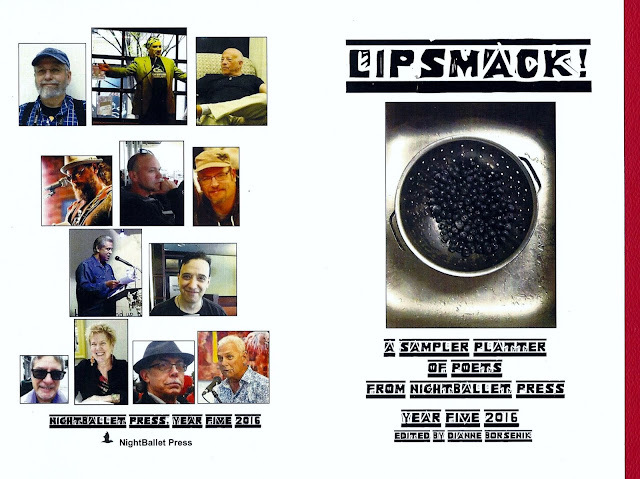 My poem "Sibyl" appears in the just published Lipsmack! A Sampler Platter of Poets from NightBallet Press, Year Five 2016, alongside work by George Wallace, Andy Roberts, Joey Nicoletti, Chansonette Buck, Lenny DellaRocca, D.R. Wagner, Steve Abbott, Robert Walicki, Wolfgang Carstens, Janne Karlsson and M.J. Arcangelini. I wrote "Sibyl" last year for an Ekphrastacy program hosted by Heights Arts in Cleveland Heights. The poem was inspired by a Herbert Ascherman Jr. photograph, and exhibited next to that photograph during the retrospective Herbert Ascherman Jr.: 40 Years. This will be my first featured reading since October, and is the only one I have etched in stone for 2017. 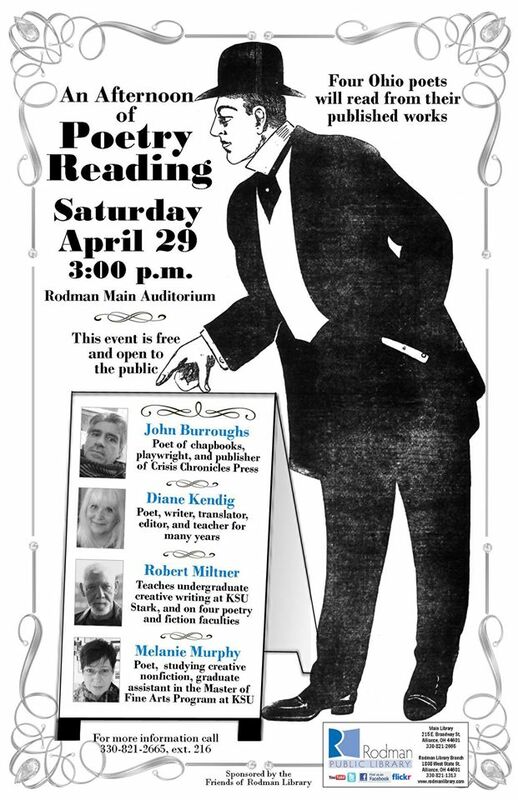 Looking forward to reading alongside Robert Miltner, Diane Kendig, and Melanie Murphy on April 29th at the Rodman Public Library! The library says, "The festivities are on Saturday, April 29th at 3:00pm. It's a FREE event, with coffee, and refreshments provided. We hope you can make it out to witness some amazing local NE Ohio poets. If you have any questions, please contact us at 330-821-2665 ex. 216." In October 2015, I was so far behind I still had 36 books in the Crisis Chronicles Press to-publish queue. Talk about biting off more than you can fit in your mouth at the same time! 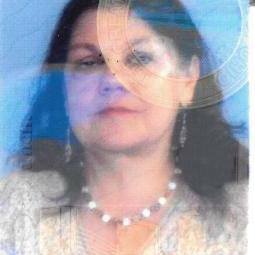 This was shortly after Geri's TIPS surgery. As that gave her some relief and she started feeling better, I started trying to catch up, and by May 2016, I only had 20 in the queue. That was still too much for me to do in a reasonable amount of time, but it was progress. Then due to a combination of factors including non-press work picking up dramatically (as it tends to do in the spring, summer and fall) and then our moving into a new house in August and Geri becoming more ill, the number stayed at 20 until March 2017. Now I'm back at it as much as my mood will allow, aiming to get as much done as possible before non-press work picks up again. The magic to-publish number is down to 17 currently and with the expected publication of three more Crisis Chronicles titles in the month of April it will soon be 14. I foresee no reason I shouldn't be able to get all these done this year. That will be a lot of fantastic publications. Stay tuned to http://ccpress.blogspot.com for the latest, and thanks so much for your continued support.